What Are the Benefits of Eating Carrots? Rachel Gussin began writing professionally in 2010. She contributes to OutdoorStore.com, with expertise in health, nutrition and fitness. Gussin earned a Bachelor of Arts in English and writing from Southern Oregon University. Carrots are a vitamin-rich root vegetable. You can find carrots in a variety of colors besides traditional orange, including yellow, red and purple. Carrots can be enjoyed raw or cooked or in juices and smoothies. This nutritious vegetable provides many health benefits. One medium carrot contains 204 percent of your daily recommended value of vitamin A, a vitamin found in animal and plant-based foods. In plant-based foods, this vitamin is produced by your body from the nutritional compound beta-carotene. This vitamin, also known as retinol, is responsible for maintaining the health of your eyes. Vitamin A helps your eyes retain their ability to adjust to changes in light and maintains necessary moisture and mucus levels of your eyes. 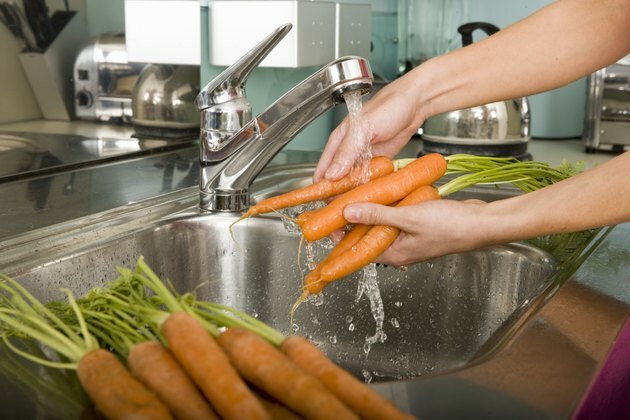 Carrots are also a good source of vitamins K and C. Vitamin K maintains your blood's ability to clot. It also contributes to bone strength and kidney health. One medium carrot contains 8 mcg of vitamin K. One medium carrot also contains 6 percent of your daily value of vitamin C, which is associated with a healthy immune system and strong teeth and gums. Vitamin C can also help your body absorb iron from plant foods and can help combat free radicals. Fiber is one of three types of nutritional carbohydrates, your body's main nutritional energy source. Fiber may be best known for its ability to promote bowel regularity. It can also help control your blood sugar levels and contribute to healthy weight management, as a diet high in fiber can keep you full for longer. A medium carrot will provide you with 2 g of fiber, or 7 percent of the daily recommended value. If you are hoping to raise your potassium intake, consider eating more carrots. One carrot contains 400 mg of potassium. The Institute of Medicine recommends that all adults consume 4,700 milligrams of potassium a day. According to the health website Organic Facts, potassium is the third-most-abundant mineral in your body. It may help reduce your risk of stroke, high blood pressure and anxiety. It helps to control your metabolism and improves the health of your muscles, heart and nervous system. Potassium also regulates electrolyte absorption and is necessary for proper hydration.